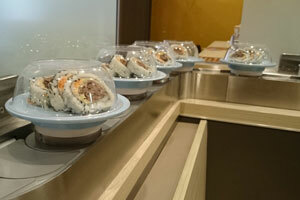 Special plates for kaiten conveyors. 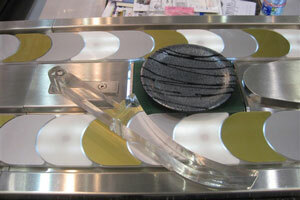 The base of a plate is suitable for all types of conveyor profiles conveyors, the form fits into any turns. 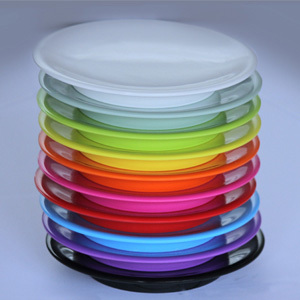 The plates do not break and can be washed in the dishwasher. diameter — 140 mm., height — 22 mm. diameter — 140 mm., height — 39 mm. diameter — 152 mm., height — 22 mm. two-color plates with drawing, 6"
Reliable and simple protection against crusting that can spoil product moving on conveyor belt. 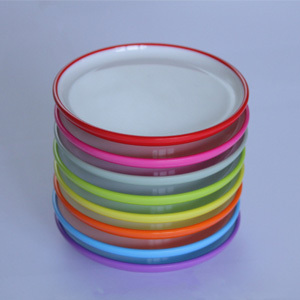 Normal, made of thin plastic, 6"
diameter — 157 mm., height — 61 mm. 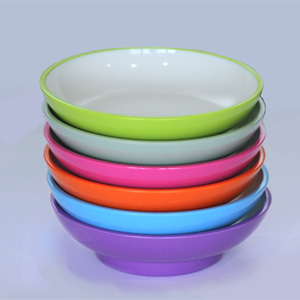 Premium, made of thick plastic, 5.5"
diameter — 130 mm., height — 58 mm. We strongly recommend the second type, as these covers are much more durable and have a better look. System of delivery of tea or other drinks (cold or hot). It is used for pouring free drinks at the seat of a client. At buffet format restaurant (payment only for an entrance), this system is particularly relevant — green tea can be given to clients free of charge. 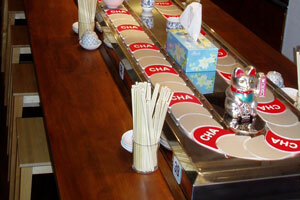 In other formats of restaurant, free green tea can be additional advantage of a restaurant for attracting clients. It is possible to install two systems — of hot and cold tea. 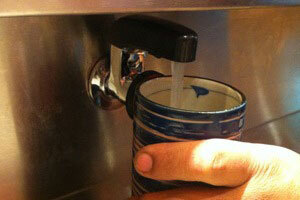 With separate taps. 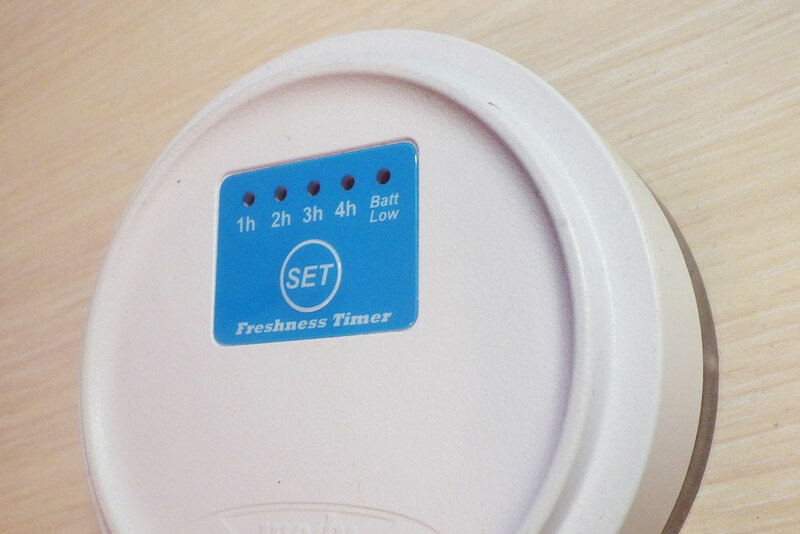 The timer is an electronic device with a built-in clock giving a red light signal when the preset time arrives. 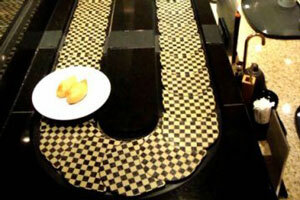 When a plate with elapsed time passes the kitchen, the chef sees it and removes this plate from kaiten conveyor. Height of a base is about 28 mm. The upper surface of the timer has special grooves under a plate bottom fixing it on the conveyor belt in case of change of movement direction. 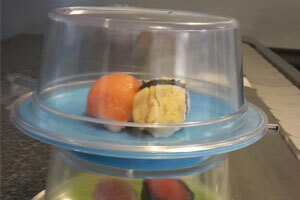 Reliable and simple system to automatically remove plates with the expired freshness time from conveyor. 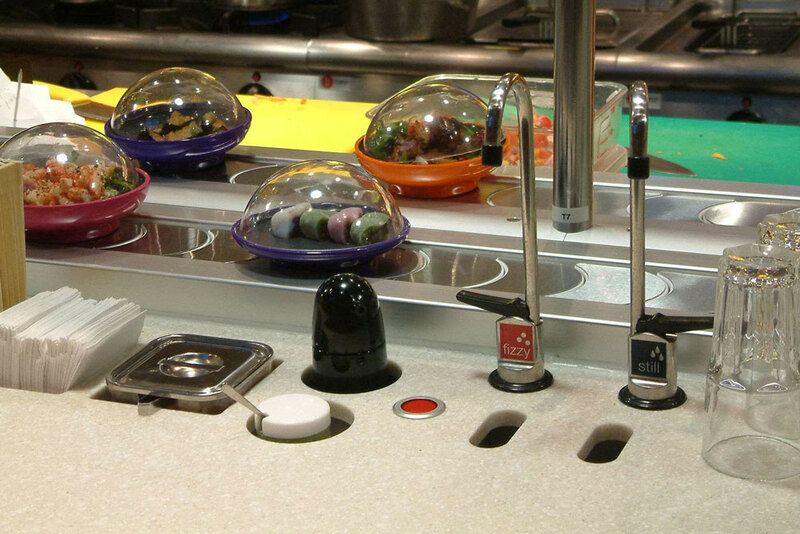 A chef puts ready sushi on plate with the built-in chip, sets on the touchscreen the allowable time for the plate to spend on the conveyor, and then places this plate on kaiten. 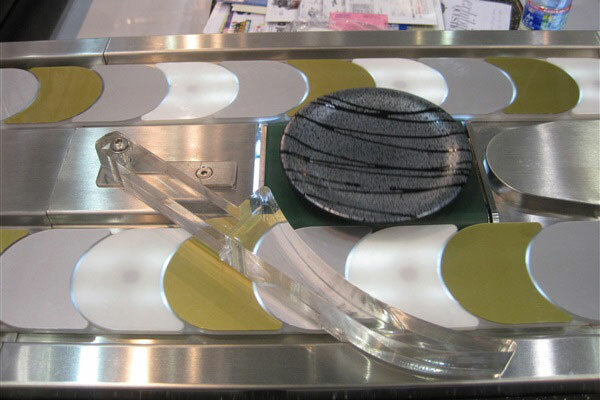 If after the expiration of the set time the client didn't take a plate from the conveyor — the dish is automatically removed from the conveyor. There are situations when it is necessary to stop part of the conveyor or its separate branch. 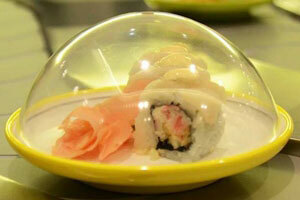 It often occurs when the restaurant is divided into several zones. Some zones can be closed when there is a small amount of clients in a restaurant. 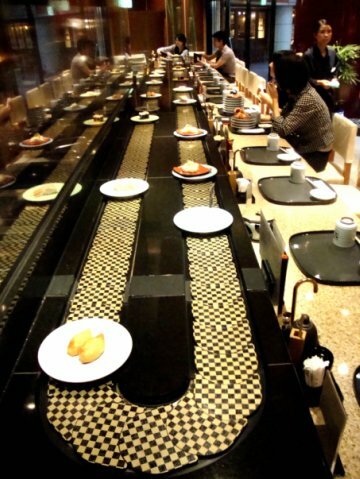 Kaiten conveyor is one working mechanism and it is impossible to disconnect any part. 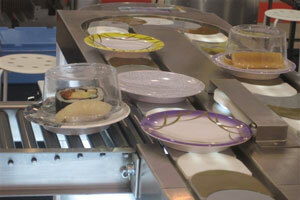 Kaiten transfer system allows you to cut off the flow of plates temporarily to any part of the conveyor. The employee of restaurant puts a transfer arrow in a closed position – after that, all plates are transferred to an opposite conveyor belt by inertia. 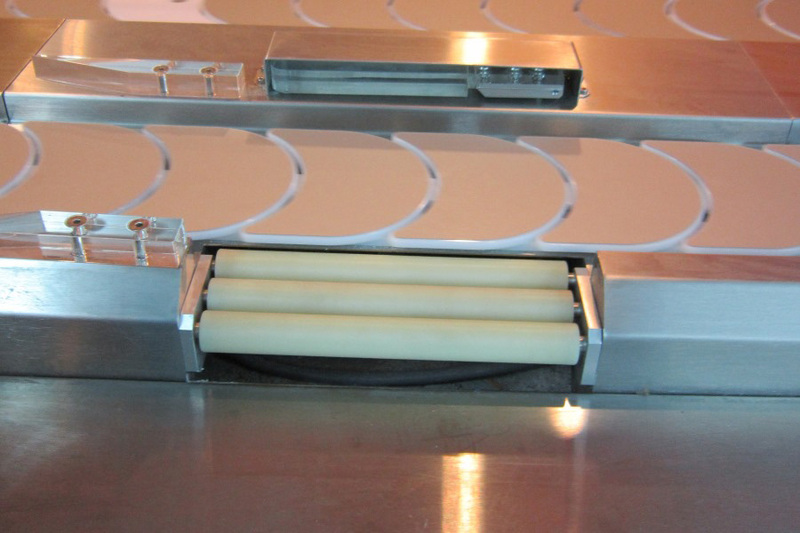 Of course, a transfer module can be installed only on a double-row type of conveyor or its double-row part. On a single-row conveyor, plates will have no place to move. 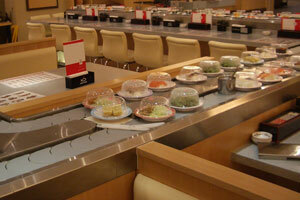 Gone are the days when kaiten conveyors everywhere looked faceless and the same. Now, at the designing stage, you can order the color of a conveyor belt according to your preferences. The price depends on the amount of printing colors. 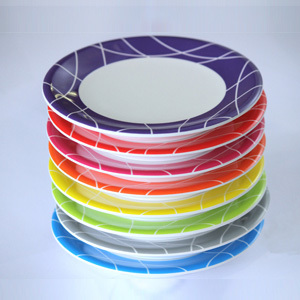 Printing is a separate production, so we need a design at the beginning of the production. Otherwise, the delay of production and installation is possible.